Hello. When I try to play a midi file on Firefox (and I assume in any other place, as it's a coded missing) I get the following error. It says that I'm missing x-midi-event decoder. Where can I find it. Everything else plays just fine, I thought I had installed all the gstreamer plugins. Of course when I click on "Search" nothing is found. Also download latest Fedora 21 ISO files in Fedora Magazine if you need. Now with the latest Fedora 21 Workstation, MIDI works fine for me, all you needed to do is to type "sudo yum -y install gstreamer1-plugins-bad-free-fluidsynth" in GNOME Terminal and play a ".mid" file, if you system version is 20 or less, try upgrading to latest version and install the GStreamer Fluidsynth plugin. Try downloading the file and using an application that supports midi playback. 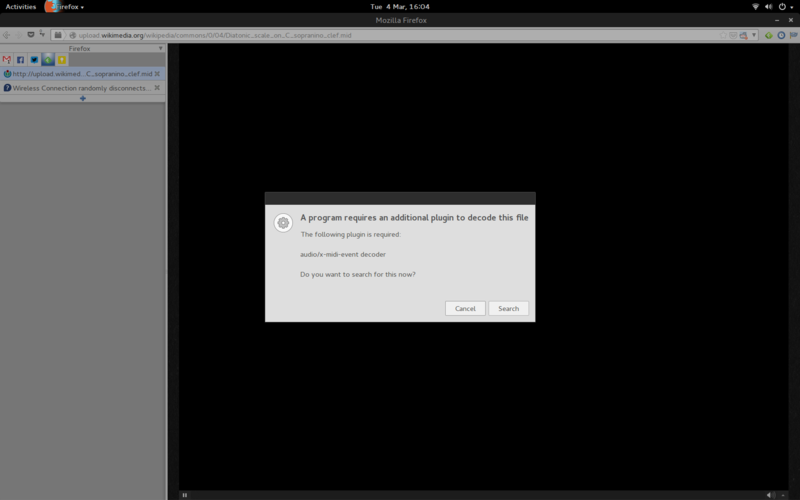 Fedora 20: How do I turn off the narrator?